Home » Library » Woof woof! Dogs bark for various reasons. In her book Barking, the sound of a language, Turid Rugaas identifies different barks of warning, fear, guarding, frustration and learned. 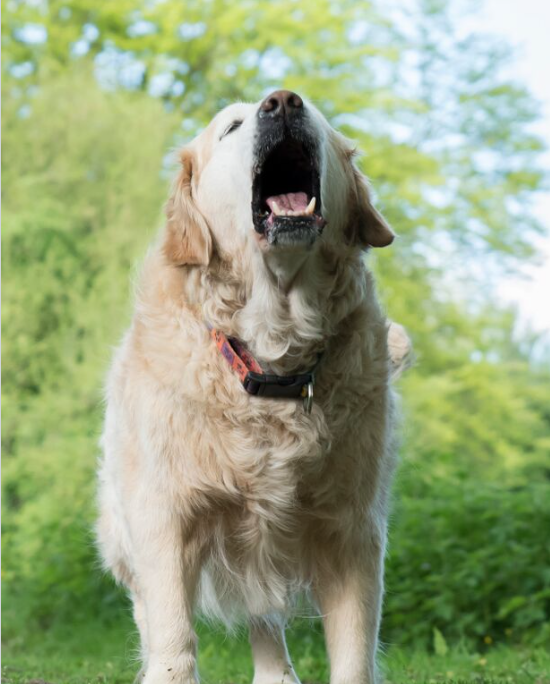 Some breeds vocalise more than others and most owners can identify different types of barks. A dog can also learn to “Speak” on cue. Dogs are often told to “Be quiet”. Unfortunately this doesn’t stop the barking, especially if your dog is attention-seeking or giving a warning bark. Warning barks are a consequence of your dog being worried and his barking is intended to scare away the intruder. Think of the postman retreating when your dog barks, in the dog’s eyes barking works! You inadvertently join in the ‘barking’ too, when you shout at him to quieten down. Attention-seeking barking is often unintentionally rewarded with a verbal response. If your dog’s barking stems from an underlying separation anxiety, speaking to him sternly may increase his distress. Barking can be a stress-release mechanism. Please don’t leave your dog in the garden unattended while you are out. You have no control over his behaviour and he may learn to bark at people, passing cars, birds or next door’s cat. If his barking is successful, it will be repeated: i.e. the neighbours go indoors, the bird flies away, the car drives on and the cat scarpers. Barking can become self-reinforcing. This means a dog learns to enjoy the sound of his own voice and excessive barking is a major reason for complaints. Learned barking for attention can have positive and negative consequences. A dog may learn that a bark at the back door lets him into the garden to toilet. Conversely a puppy may learn that barking and whining lets him out of his crate, and he never learns to settle. How can we minimise barking? Leave your dog inside the house when you go out and restrict his window view to prevent him barking at comings and goings. Ignore any attention–seeking vocalisation, especially from puppies, so he learns barking never gets what he seeks. Don’t order your dog to “Be quiet”. Instead, call him to you saying “Sweeties” and give him a tasty treat. “Sweeties” is a happy word that minimises your stress towards the barking, thus reducing your dog’s anxiety. Rather than rewarding the barking, your dog learns to come and find you for a treat instead of continuing to bark. Then ask yourself, what would I like him to do instead? Direct his attention elsewhere. Prevention is better than cure, so manage the environment to minimise barking in the first place.